Through our audits and inspections, we find unsafe conditions around the use of proper Ground-Fault Circuits Interrupters, GFCI, or lack thereof. Ground-faults happen when a break occurs in a low-resistance grounding path due to a tool or electrical system. This current may take an alternative path to the ground through the worker, resulting in injury or death. GFCIs are designed as a fast-acting circuit breaker, shutting off electric power in the event of a ground-fault. 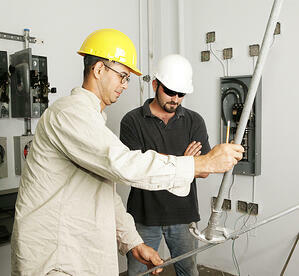 Using proper GFCI along with proper safety training plays a crucial role in preventing electrical hazards. GFCIs “sense” the amount of electricity flowing in the circuit from even small amounts of milliamps, hence the GFCI reacts quickly if it is necessary to shut off the circuit. Its main purpose is protecting workers from electrical shocks; GFCIs are usually used on construction sites, wet locations and other high-risk worksites. While GFCI does not protect workers from touching two “hot” wires contact hazards, it will protect against ground-fault, which is the most common form of electrical shocks, as well as the destruction of wire insulation, fires and overheating. There are three main types of GFCIs available to assist in proper electrical hazard prevention. Receptacle Types incorporate GFCI devices in one or more receptacle outlets. Because of this these devices more cost effective and have increased in popularity. Portable Types come in a number of styles designed for easy transport. Some of these are to be plugged into an existing non-GFCI outlet or to be connected with a cord. Portable types of GFCI may also incorporate a no-voltage release which will disconnect port to the outlet if any of the supply conductors is open. These types must be approved for the environment they are being used in, i.e. if it is exposed to rain they must be waterproof. Cord-Connected Types are attachments to the plug that incorporate a GFCI module. This protects the cord and any attached equipment to the cord. These types have non-standard appearances with reset and test buttons and like the portable type, they have a no-voltage release. It is important to remember that GFCIs are to be installed in worksites where objects can conduct electricity easily, such as a close proximity to water. Testing must be done on a minimum of a monthly basis as GFCI devices can damage and wear out. This can be done by simply pressing the “Test” then the “Reset” buttons, be sure to consult the instructions before attempting this for the first time. If the GFCI circuit fails to work, a qualified electrician must replace it as soon as possible. GFCIs alone will not guarantee the safety of your workers, proper safety training is crucial in maintaining an injury-free workplace. Following OSHA regulations on electrical safety in your workplace is a great way of starting this process. For a list of training course with OSHA standards and pricings click the button below to download our safety training catalog.